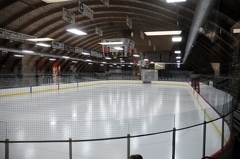 Warroad versus Roseau. 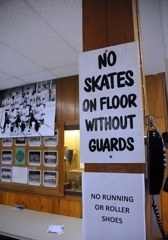 Two towns separated by just 22 miles of barren, snow-swept highway. 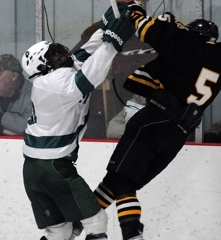 Two towns with an intense love of hockey. 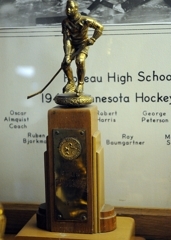 The Warroad versus Roseau rivalry has featured plenty of memorable moments throughout the years. 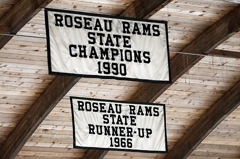 Tuesday night, Feb. 1, another chapter was added to its history. 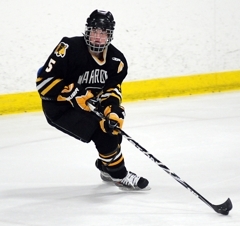 Warroad’s Austin Streiff scored on a 5-on-3 power play midway through overtime to give the Warriors (14-7-0) a controversial 5-4 victory over Roseau (8-10-0) at the Roseau Memorial Arena. 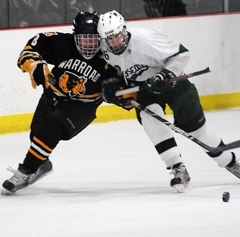 “It’s unreal,” gushed Streiff after untangling himself from a pile of celebrating Warriors. 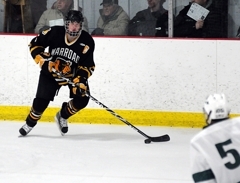 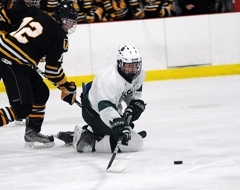 Streiff, just a junior, is quickly making a name for himself in the annals of ‘The Game.’ He also netted the game-winner in the teams’ first meeting back on Jan. 13, a 4-1 victory at Warroad. 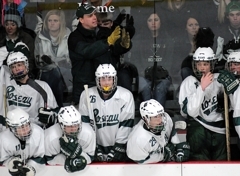 “You grow up 20 minutes away from them. 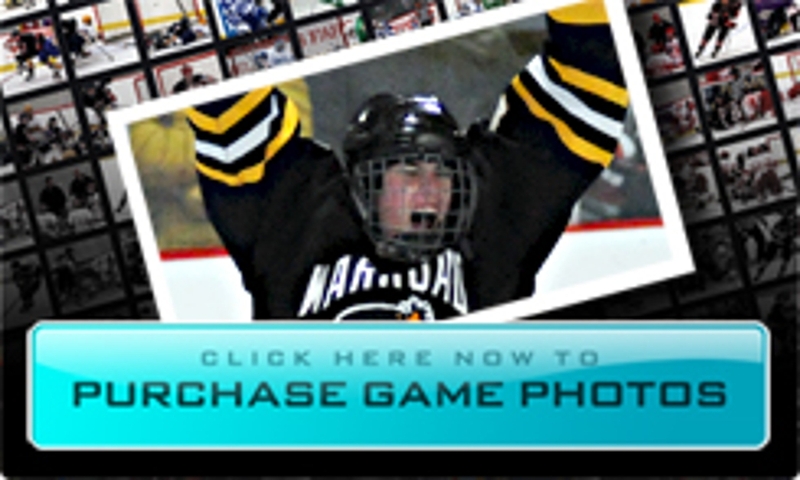 You know them all really well. 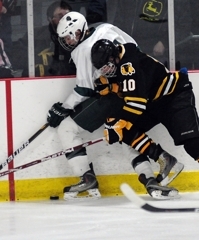 Some you’re friends with and some you might not like that much,” said Streiff. 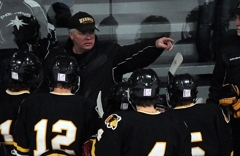 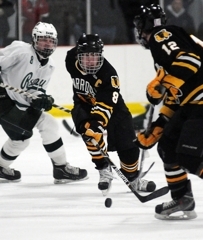 Warroad coach Albert Hasbargen agreed that the rivalry is fueled both by the proximity of the towns and their love of hockey. 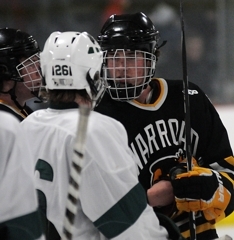 “We all know each other so well. 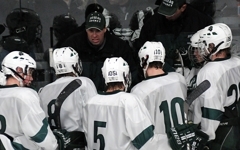 It’s like brother versus brother,” explained Hasbargen. 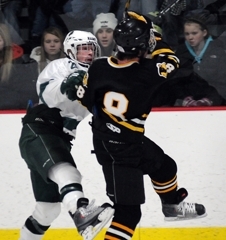 And everyone knows about sibling rivalries. 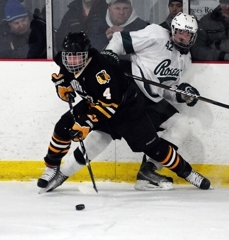 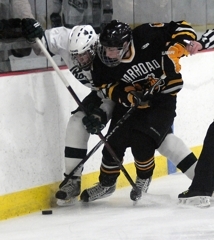 For the next year, Warroad gets to rub a bit of salt into the wound after sweeping Roseau in both meetings. 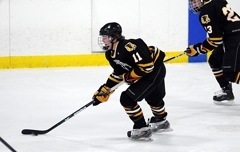 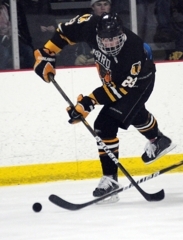 The sting is even more intense after the Rams were called for three penalties in overtime, including a cross-check on the team’s best penalty killer, Shane Omdahl, that gave Warroad a 5-on-3 advantage. 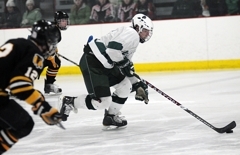 It took just 12 seconds for Streiff to score the game winner on a rebound off Roseau goaltender Mike Tangen. 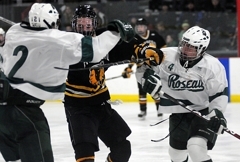 While Warroad celebrated, Roseau players quickly left the ice. 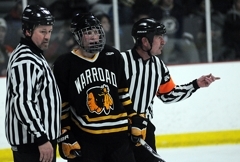 Rams’ coach Andy Lundbohm quietly talked with the referees for a moment, then exited the rink entirely without comment. 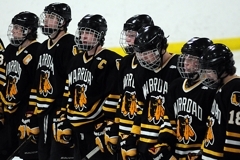 Warroad never trailed in the game, five times taking a one-goal edge on the Rams. 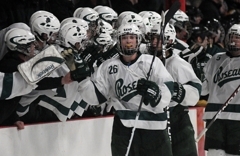 Four times, Roseau came right back to tie it up, including Mike Johnson’s scrambling goal with 40 seconds left that sent it to overtime. 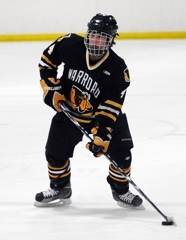 His tally came just over a minute after Stoskopf had given the Warriors what appeared to be the winning goal with 1:52 remaining. 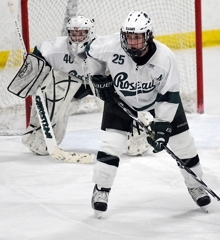 Roseau outshot the Warriors 35-18, but junior goaltender Andy Foster came up big with 31 saves. 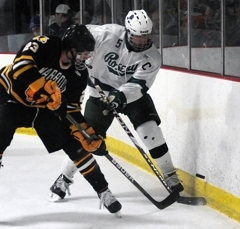 Tangen stopped 13 for the Rams, who controlled the territorial advantage through long stretches of the game, but could not capitalize. 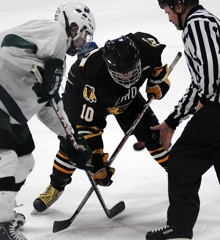 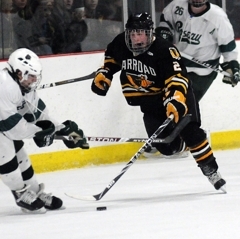 Tyler Elson and Brandon Pearson each had a goal and an assist and Carson Gray tallied three assists for Warroad. 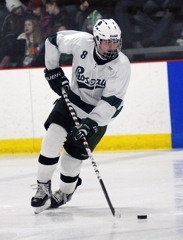 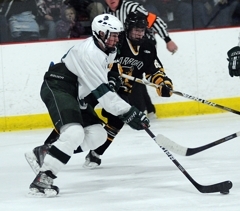 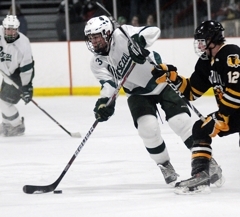 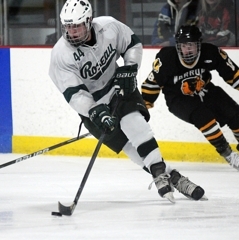 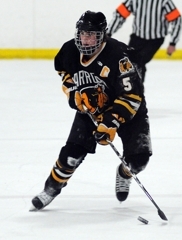 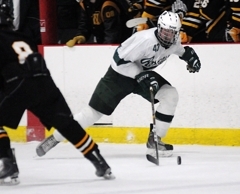 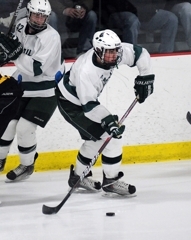 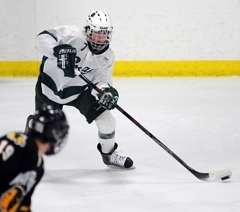 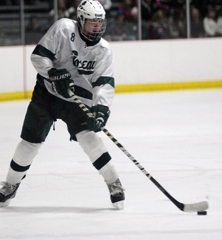 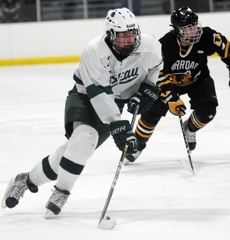 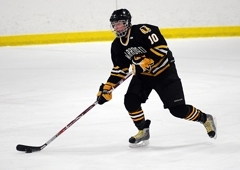 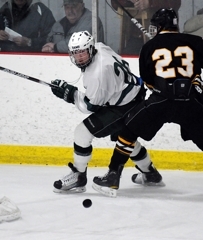 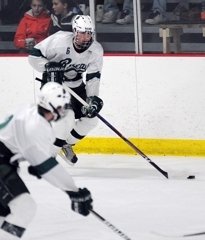 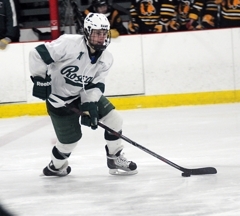 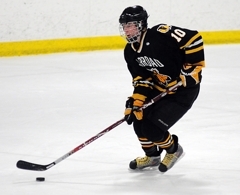 Travis Connell scored twice for the Rams, while Omdahl had a goal and two assists. 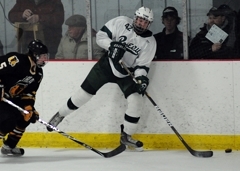 The lanky junior certainly knows how to come up big in big games. 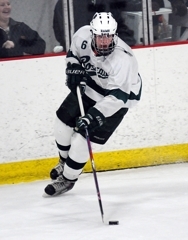 He tallied the game-winner in overtime on a 5-on-3 power play Tuesday night to beat rival Roseau, 5-4. 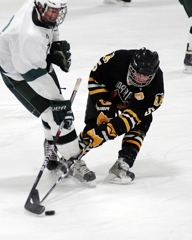 Streiff also had the game-winner in the teams' first meeting back on Jan. 13. 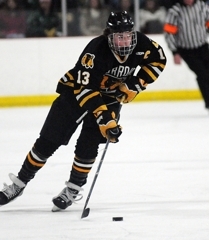 He described the feeling as unreal and that he was "living the dream." 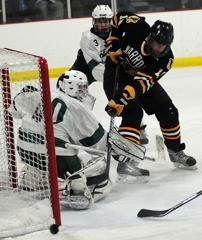 Foster, a junior goaltender, continued his strong play in nets for Warroad, making 31 saves on 35 shots. 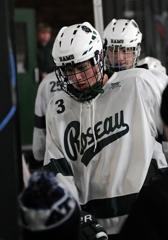 Roseau outshot the Warriors, 35-18, but never led thanks to the steady and calm nerves of Foster. 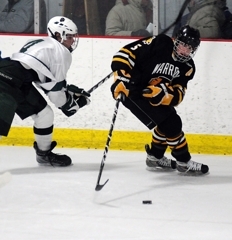 The senior is the heart and soul of the Warriors and he brought his game Tuesday night, scoring twice and adding an assist. 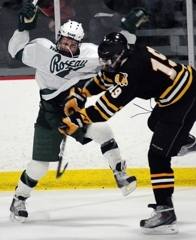 Though quick and skilled, Stoskopf doesn't shy away from contact -- in fact, he seems to relish it.